Moved but computerless. I promise great house pics as I haven't been knitting or spinning much. 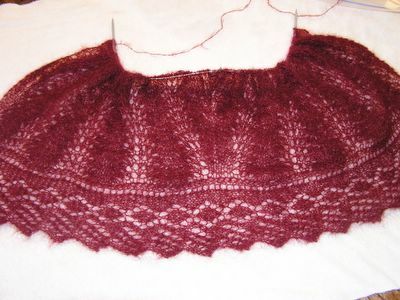 The paisley shawl has caught my attention again but I think I will add some faggotting and an extra edging. 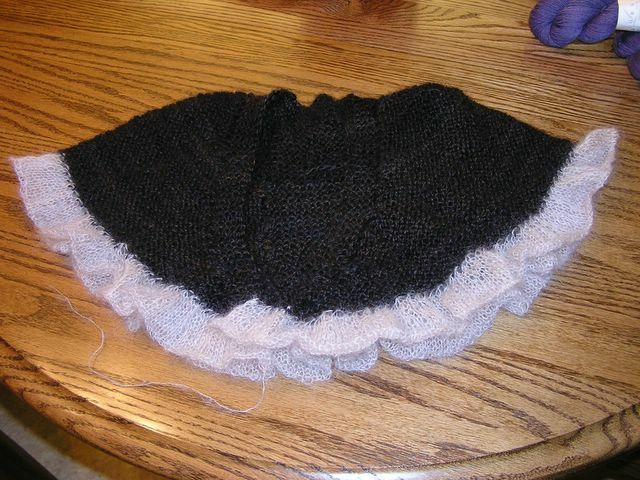 I'm through 10 rows of the edging and still haven't started on the second of the two required balls. It may take another week or so to get a computer up and running. If i'm kinda silent for a week or so don't tune me out. We are full fledged moving! I love my new house. I have again picked up Karis. It is a great project for now because it is easy and right now I need easy. The paisley shawl is at the paisley part and it takes a little more attention than I can give. Fenna is finished! 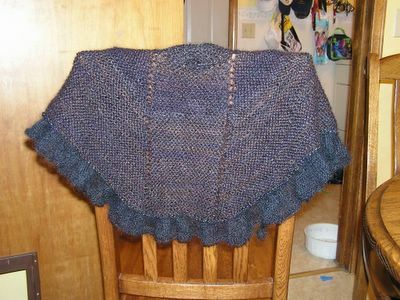 My first handspun handknit project I'm very pleased! The picture doesn't accurately show the color and you can't see the beaded edging but you get the idea:-) I don't know if I want to do a hook closure or make my own buttons with the beads and rings. Have to decide. Suggestions? My spinning class was amazing! The teacher was just super. She basically has a lot of knowledge and wants us to get out of the class what ever we want. She's got all types of fibers for us to try. she's flexible on hours. She's not hovering but if you need her she's there with very practical advice! I'm going to love this class and may have to take again! I'm on my third incarnation of Fenna. First was the caramel colored mohair fiasco,then the make a lace edging out of the handspun that you don't have enough of fiasco, now The Final, a ruffle edging with beads where I picked up the stitches. Yes it is mohair, but Fenna can bleed all she wants it ain't gonna effect the black mohair. Today is my first spinning class. I'm a little nervous, new people, new place and all that but I'm also excited. 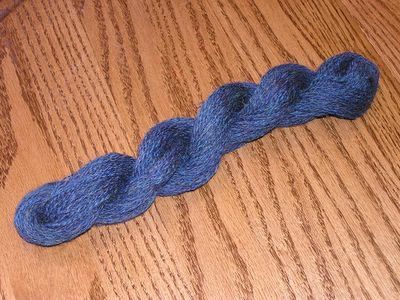 I plied some corriedale I found at the bottom of my basket when cleaning. I spindle spun it so it is finer and more consistent. It's only 100 yds though. 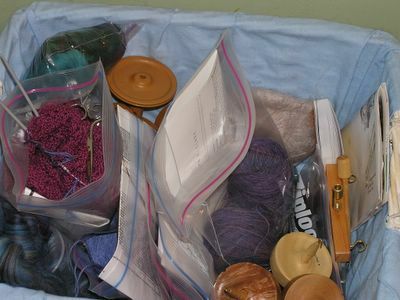 I'm collecting my 100yds here 50 yds there and plan to make a great shawl or some faireisle socks. 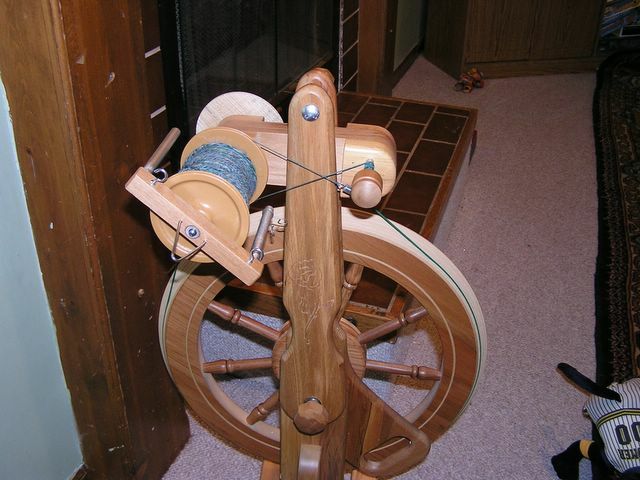 I was so preoccupied with my wheel that I kind of neglected my spindles. I just rediscovered how much I like spindle spinning. I have some lace weight singles I just finished that I will try to ply on the wheel this week. I also discovered I missed my first spinning class. I'm so preoccupied with moving, which we hadn't planned to do in April when I signed up for the class, that I just spaced it. I am so bummed because I'm sure she probably did fiber preparation which I have no experience with. Oh well these things happen(to me all the time)! I'm a bad girl! Yes, I need to finish Fenna, get packing,finish Paisley shawl, get packing, finish Karis and oh yeah there is the garden shawl for the periwinkle along. In true Yarn harlot fashion, I started another project. Soothing socks. I LOVE Lorna's Laces Shepherd Sock. 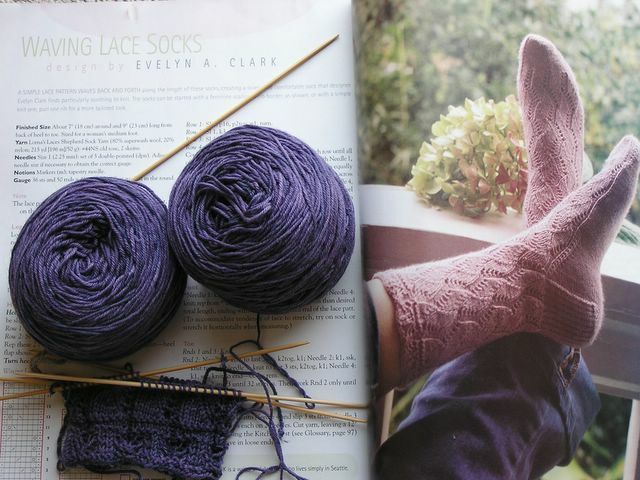 The blackberry color is so great and I'm doing Waving Lace Socks from Sring '05 Interweave Knits by Eveyln Clark. Two projects by Evely Clark. Hmm becoming a fav with me. I hope she continues her relationship with IK. Fenna is a beautiful feminine girl and I love her...but... and this is my fault for not listening to my inner slightly experienced fiber person, she has a little problem. Most people wouldn't notice her problem. I do. She will go to the frog pond to rectify her problem. The handspun bled oh so slightly into the kidsilk haze. Since she is going to the frog pond I'll make her more beautiful. I knit the shawl as the pattern called then I dropped the handspun then added the kidsilk haze and made a ruffle. I think this time around it will look neater if I cast off and than pick up the ruffle. Only dry cleaning for this delicate angel unless one of you color gurus have ideas on how to keep it from bleeding. Vinegar maybe? We had loads of fun. I finished Fenna and am very pleased. I only did slight stash enhancement. 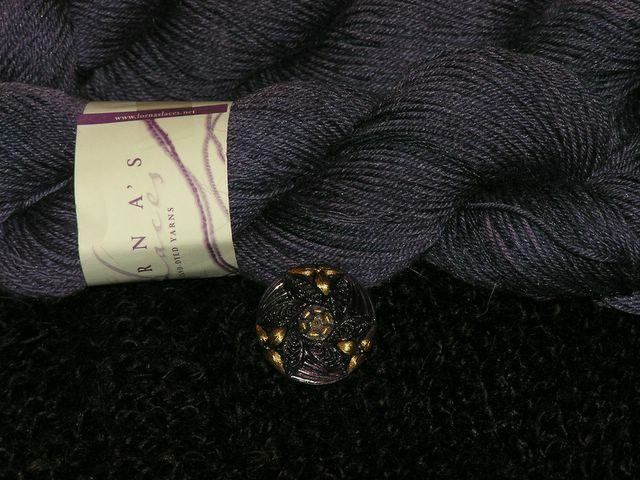 Two skeins of Lorna's Laces sheherd sock in blackberry and a pretty button for Fenna. We are all tired. Next up finish paisley from IK spring '05 by Evelyn Clark. I'm on the paisley edging but think I want to do an additional edging if I have extra yarn. My newest baby is helping with the stress of moving. This is my Majacraft Rose. Right now she is a life saver. Not only is it spring break but I've got people breathing down my neck to pack everything yesterday. We have two more weeks and with the kids underfoot it is very difficult. We also need to live with some of the stuff. Being able to walk around the house is a plus too. If we boxed all the things then we probably wouldn't have that luxury! 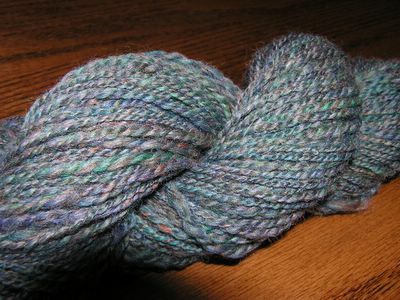 I have been knitting furiously on my handspun wensleydale . The fabulous Lisa Souza dyed the top. I love her stuff. 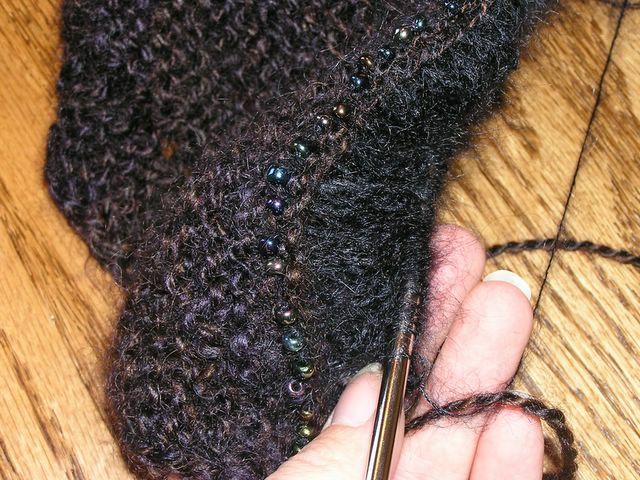 I'm making Fenna from Myrna Stahman's book Shawls and Scarves. I don't have much yardage so I may have to fugde at the end. I've got some ideas. Of course there is always the frog pond. I'm kind of technology impaired so bear with me until I work out the bugs. 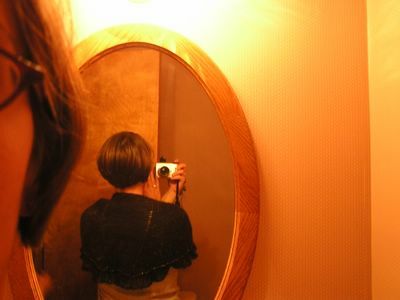 I decided to join the blogging fun. I also decided to join the spinning fun. I bought a wheel a couple of weeks ago and this is my first plyed kein. I swore I'd never spin. Take too much time from knitting I said. Yes, it does but I don't care. I love it!